Dirt Devil’s BD10045RED AccuCharge 15.6 Volt Cordless Hand Vacuum claims to have a pretty special battery and charger system for being available at such a reasonable price. Let’s look at that and its other features to see if those claims pan out. The AccuCharge’s power is one of its best assets. Its 15.6 volts are how it gets the job done, with suction that rivals much larger and heavier handhelds, and even cordless stick vacuums on top of that. This vacuum is best for bigger, obvious messes, like cereal or spilled rice, for example. Its strong power is best utilized by holding it at a relatively vertical 60 degrees, so it can be a little awkward in certain crowded environments, but you’ll appreciate the strength it has for heavier debris…or, say, a very large and intimidating bug. One of the AccuCharge’s more interesting features is a quick-flip crevice tool in its front – it’s incredibly convenient to have what is normally an accessory so conveniently integrated into the vacuum. You can’t ever misplace it, and it works great on window sills and in furniture cracks. Also, a D-shaped handle is pleasantly ergonomic. This vacuum derives its name from the AccuCharge technology that its charger is based on. The charger (which is also EnergyStar certified) charges the vacuum’s NiCad battery twice as fast as other chargers, in six hours, and uses 70% less energy. After the battery is fully charged, the device will shut off and then periodically check to see if the battery has depleted at all, and then only charge as much as necessary to renew it. It’s a great way to extend the life of your vacuum’s battery! 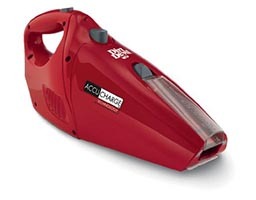 At 3.25 pounds, the AccuCharge is about average for handheld vacuums. In any case, the D-shaped handle makes it easy to carry and use. This vacuum uses a sponge rubber filter – it’s a simple kind of filtration system that might clog up, especially if there’s any moisture in the mess to be cleaned. In the same token, however, this kind of filter is very easily washed and replaced. Dirt Devil has designed this vacuum with an interesting style of dust bin – instead of a separate container to be removed, the vacuum itself is cracked open over your trash, which some people definitely prefer over having to deal with more moving parts. Though it is seemingly not advertised as such, the AccuCharge actually does come with a brush tool that helpfully attaches to the rear of the vacuum. Also, extra filters are an optional accessory. Though extra care needs to be taken when charging NiCad batteries to make sure you get the most use out of their lifespan, that’s actually the beauty of the AccuCharge: its unique charger is specifically designed to do just that for you, and will potentially keep your vacuum running for years. Dirt Devil seems to have taken that potential lifespan into account in their warranty. Its three year limited warranty is much better than even many high-end vacuums’ maximum of two years. Given this vacuums power and special charger, you’re definitely getting a lot of bang for your buck with its relatively lower price. If you want solid quality without spending too much, it’s definitely the right price. Dirt Devil’s AccuCharge offers a couple great things for a reasonable price: surprisingly strong power and a unique charger that makes the most out of its cheaper type of battery. It may not have the bells and whistles of higher-end vacuums, but it’s a workhorse that will get the job done and save you a little money on your energy bill to boot.